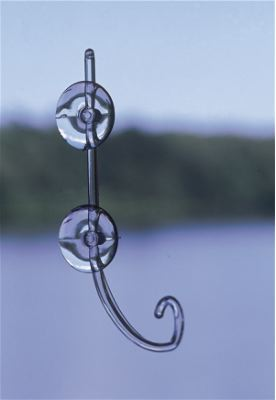 Is there really a Cool Tube Bird Feeder out there? 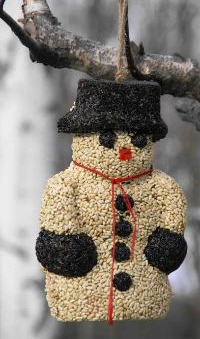 Although birds won’t think so, some bird feeders are just plain boring. 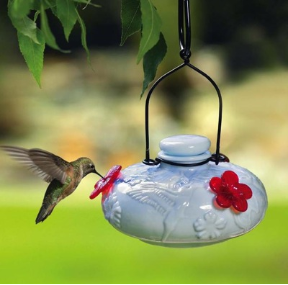 It’s the birds themselves who make these feeders come alive and give us so much pleasure in watching. A very popular style is the tube. Platforms are great for versatility, and hoppers tend to have larger capacities. 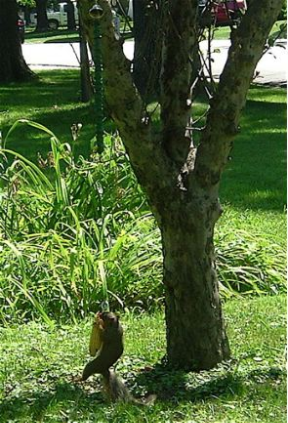 There’s bluebird, finch, oriole, and hummingbird feeders, and there’s peanut, fruit, seed, and suet feeders. Omg… where would one start? 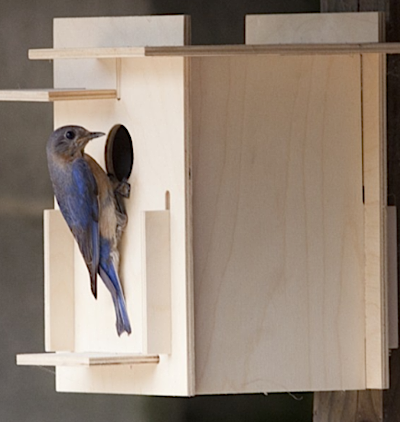 One feeder that’s capable of attracting several species is a great place to start. 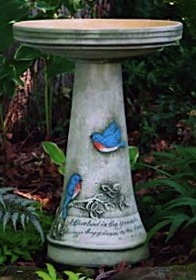 That and definitely a birdbath – even if it’s just a plant saucer with fresh water! 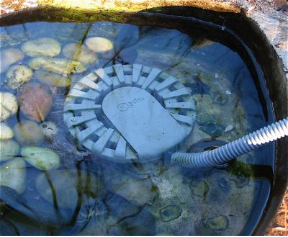 The cool Wave Feeder shown here accommodates black oil sunflower, which attracts a wide variety of birds. If you’re looking specifically for finches, it’s also available for thistle seed. Handcrafted in the USA of durable cedar, it’s one that will be around for many years! 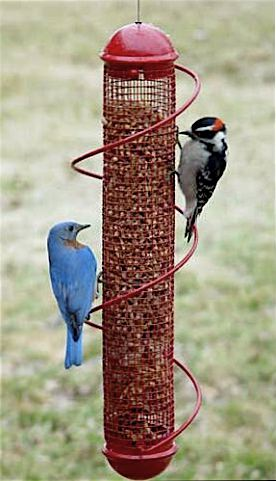 Although wavy is shape, it gets classified as a tube bird feeder because of the perches. Hoppers have ledges where birds perch to eat. Not all tube feeders have perches though. Some offer “all-over” feeding with the body being screen or mesh. And a really innovative idea is the spiral tube feeder. 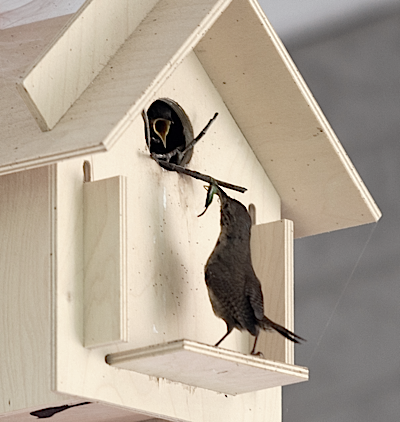 Instead of perching or just clinging, birds actually “run the spiral” while dining. Now this may sound silly, until you’ve seen them in action! 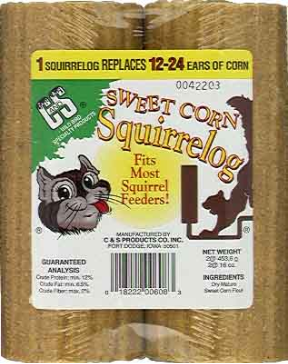 A peanut feeder is shown here, which proves tube feeders aren’t just for seed. The spirals offer options for shelled peanuts, thistle (or nyjer), and of course seed. 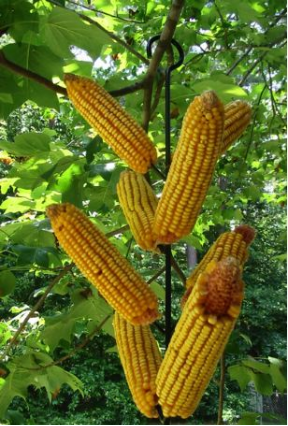 One other thing to consider when starting out: don’t go for the cheapest seed! It has fillers which end up on the ground and attract some less desirable birds. Spending the extra few dollars on a premium seed will absolutely bring better birds! 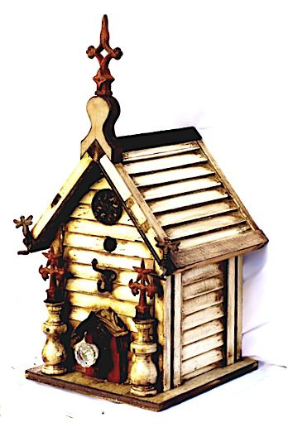 Save on Wood Birdhouses… and everything else too! Since the shopping craze will commence soon, we’re starting early with some attractive discounts and offers that will help stretch limited shopping dollars on some very cool wood birdhouses… and everything else! and shipping is free on $95 or more. Additionally, Paypal has partnered with us offering their 6 months-same as cash deal! And by the way, you might like this Texas artist extraordinaire? Handcrafted wood birdhouses done in reclaimed materials and vintage hardware, no two exactly alike. Meant for the outdoors and feathered friends, they make the perfect nest site and roosting spot for cold nights. Truth be told, most folks prefer to keep them indoors because of their old world beauty, and unusual charm! Now with 6 months to pay, 10% off and FREE Shipping on us… that’s a deal to make any persons’ holiday bright and merry! Unique Birdhouses & Very Wild Feeders… Wanna See Some? And Get a Discount Code Too! 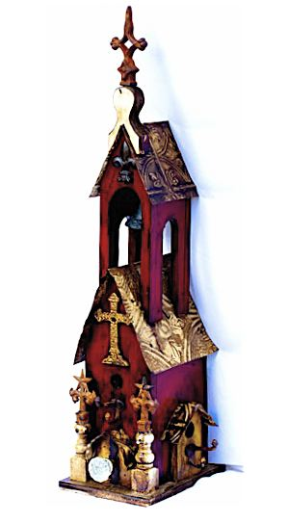 Lots of companies tout the word unique when referring to their birdhouses and wild bird feeders, but if you keep seeing the same items over and over again, what’s so unique? Check out this fun video (like 30 seconds) to get a quick glimpse of what The Birdhouse Chick offers. We think you’ll like what you see, and if you do, jot down promo code MC10 to nab 10% off your next order! Please donate whatever you can to help two-and four-legged victims of Hurricane Sandy. (SEATTLE, WA–NOVEMBER 2012) –Liz Baker, executive director of GreaterGood.org, announced today that the first round of disaster relief grants, totaling $45,000, have been sent to animal rescue first responders and shelters dealing with the aftermath of Hurricane Sandy. These grants were made possible by funding provided by GreaterGood Network’s The Animal Rescue Site (http://www.TheAnimalRescueSite.com). 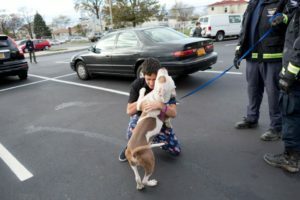 “GreaterGood.org is providing $10,000 each for the Woodbridge Animal Shelter and the Humane Society of Atlantic County which have been hard hit by the flooding. We also are sending $25,000 to the International Fund for Animal Welfare (IFAW) to aid their efforts to rescue animals left behind in flooded areas,” explained Baker. Both the Woodbridge Animal Shelter and the Humane Society of Atlantic County are located in New Jersey, which experienced some of the worst flooding following Hurricane Sandy. “Our shelter is approximately thirty feet from the Woodbridge River which flooded during the hurricane,” said Heather Campione, Woodbridge Animal Shelter Supervisor. “The water surge filled our basement and came five feet into our main floor.” Although able to move the animals out of harm’s way, the shelter lost all of their supplies, medicines, and food. 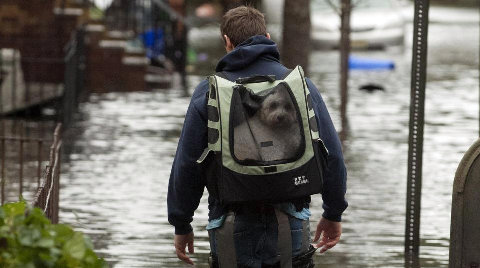 IFAW is currently conducting door-to-door searches in previously flooded areas to find pets left behind during evacuation. Funding for these grants came from small, individual donations given through the Gifts That Give More [tm] program at The Animal Rescue Site (http://www.TheAnimalRescueSite.com). In recent years, GreaterGood.org’s disaster relief grants for animal rescue following natural disasters have topped more than $1 million overall. These include support of IFAW and Humane Society International animal rescue efforts in Japan following the 2011 earthquake and tsunami; the ARCH rabies vaccination campaign of 50,000 animals in Haiti in 2010 following thee earthquakes there; and the care and feeding of animals impacted by storms in the United States. At the beginning of 2012, GreaterGood.org’s donation of $75,000 paid for the rebuilding of the Guthrie, Oklahoma, shelter after it was struck by a tornado in 2011. Through December 2012, visitors to TheAnimalRescueSite.com can select local shelters and rescue groups to receive additional grants in the $300,000 Shelter+ Challenge with Petfinder.com. More than $1 million in Challenge grants has been awarded since 2008 to nearly 300 shelters in North America through this program.